US ambassador denies that his statement on Republican support for Israel was "a partisan shot." 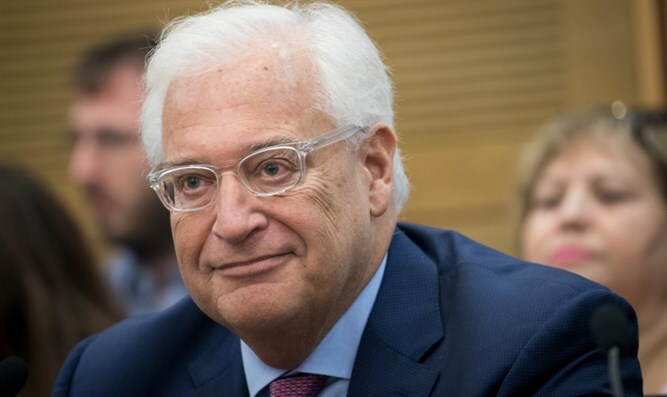 US Ambassador to Israel, David Friedman, took to Twitter Friday in order to deny that his statements on Republican support for Israel were "a partisan shot." "Observing overwhelming Republican support for Israel is not a 'partisan shot' as some have described," he argued. "I firmly believe that American support for Israel needs to be bipartisan and I will continue to welcome any Democratic legislators who wish to visit Israel – and I hope they do!" In a Times of Israel interview Thursday, Friedman berated the Democratic Party for failing to rally grassroots support for the Jewish state. “The argument that I hear from some Democrats that Republicans are seizing the pro-Israel mantle is true, to a certain extent. There’s no question Republicans support Israel more than Democrats,” Friedman said.